In a few months the temperatures will rise. The summer sun will shine hotter and brighter, making many of us look for places to cool off and beat the heat. Pools, glorious swimming pools, will be the place to be! While pools offer exercise, fun, relaxation, and relief from the heat, they can also pose several dangers, especially for small children. This spring, make sure your child or grandchild is ready to enjoy the pool safely this summer! All children should learn how to swim. All children and teenagers should wear life vests when they are near bodies of water. Parents and guardians should never leave children alone and unattended near any open water. This includes pools, spas, bathtubs, rivers, lakes, etc. Also, do not leave the child in the care of another child. Swimming is a family activity, and parents should learn how to swim and educate themselves about pool safety. Even when children are under the supervision of older children, a supervising adult should still be present at all times and not be distracted. Be sure to never leave small children alone in the bathroom. To prevent drowning, toilet locks should be used. Empty out water in containers (like buckets, tubs, kiddie pools, etc.) as soon as you are done using them. Leaving any amount of water accessible could be dangerous to young children. Since all children should learn how to swim, how early should children start taking lessons? 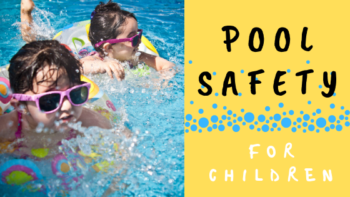 AAP shares that “Studies show that swim lessons starting around age 1 can reduce a child’s risk of drowning.” In addition to physically learning how to swim, children should also learn basic water safety. Rest assured, CBRC has you covered for all of your swimming needs! Offering swimming lessons for children of all ages, CBRC also incorporates water safety into all classes. Taught by certified instructors, our classes are available at every level. Children ages 6 months to 3 years can begin in the Parent-Tot level. Check out our Swimming Lessons page for details on lessons, and how to register. There is still time to register for lessons before summer! At CBRC, the safety of our members is of our utmost concern. Help us stay proactive by making sure that our children are safe and happy while enjoying the pool not only this summer, but year round!